Both of my twin daughters learned to ride recently....very exciting and nerve rracking at the same time because they can't always stop when they need to! They started off with wooden bikes from Skuut and learning to balance was easy for them. Pedaling and braking not so easy. When they grow tall enough I plan to build up some very light 20" frames with baskets, bells, short-reach brake levers and of course custom paint. Seeing my kids ride bikes is awesome. 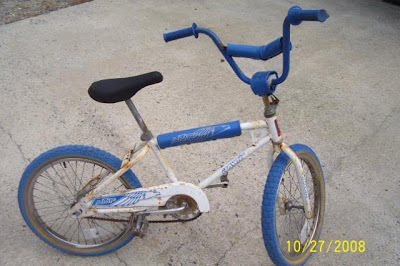 I remember vividly the first time I rode a bike...it was an early 1980s 20" AMF Hawk and I'm pretty sure my parents bought it at Sears. The color scheme was basically the opposite of this one I found on BMX museum....it was a darker blue with white or silver accents.